It probably goes without saying that Harry Styles is literal perfection in human form, but just in case you're unaware of the veritable Adonis that is the One Direction singer, let me repeat that again: Harry Styles is literal perfection in human form. And like all boy band members or greek gods at that level of adoration and fame, the rumor mill starts churning like a Puritan woman making butter, which is probably the most random and hilarious simile I have ever written. The pedestal is real, my friends, and Harry Styles is sitting all pretty right at the top. And like Lindsay Lohan before him, I'm gonna go ahead and assume that Harry Styles is tired of rumors starting and is sick of being followed. Sure, things were undoubtedly tough for LL back in 2004, but there is literally no chill whatsoever when it involves gossip about the guys of One Direction. Like, imagine the most outlandish, this-is-so-false-I-don't-even-know-why-I'm-dignifying-it-with-a-response piece of gossip you've ever heard about yourself. Then imagine that item traveling through an insane game of Telephone, stick it to the hottest commodity at the moment, and now you know what it's like to be One Direction. And since Harry Styles is widely considered the ~breakout star~ of the band (haters to the left), he gets the brunt of dat gossip. And some of it is literally cray. 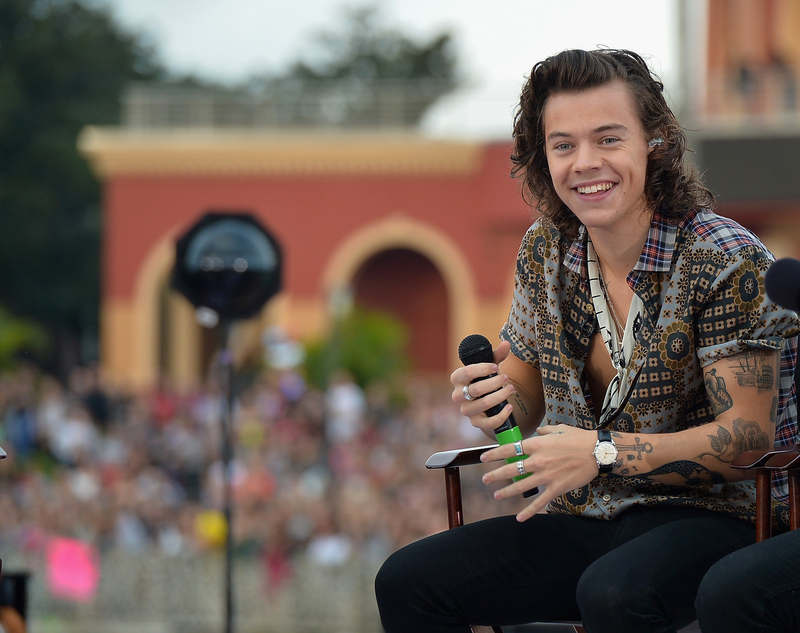 Here are the most ridiculous rumors about Harry Styles ranked from "are you kidding me?!" to "people dedicate their lives to this rumor and I'm scared." These rumors have been swirling long before Zayn Malik quit One Direction, but they really reached a fever pitch in the graveyard that was post-Zayn madness. No matter how many times the One Direction camp denied that Harry Styles would be the next to leave the band, the rumors just kept popping back up — probably because of super conflicting comments from 1D boss Simon Cowell. But since it was actually Malik who was ~the first one to say goodbye~ and left 1D a four piece, I seriously doubt that Styles would up and quit the game now. Sure, he'll probably go solo eventually, but it will be after 1D has already disbanded. Once upon a time, in the merry old land of Oz, The Sun reported that Harry Styles was being scouted to play Fiyero in the upcoming movie version of Wicked. But before you could sing "Dancing Through Life" or Google which Wizard of Oz character Fiyero would turn into (spoiler: it's the Scarecrow), Gossip Cop shut this rumor down quick. Phew. Despite the Internet hoax that claimed he died in a car crash in 2014, Styles is alive and well and living in Vegas (or London... or Los Angeles... or something). Even though pretty much no one actually believed that the singer had passed away (1D fans have gotten way too jaded about things like this) just the thought alone is enough to make me weep like the reaction GIF above. Back in 2012, rumors were flying that the boy bander punched a paparazzo at the Men in Black 3 premiere in NYC. Turns out Harry Styles isn't Justin Bieber, so this never actually happened. He cleared up the rumors with the quote-worthy line: "I definitely didn't punch anyone!" Good to know. I am equal parts feverishly excited/crapping my pants to talk about the taboo nightmare that is Larry. To put it bluntly: THERE AIN'T NO RUMOR LIKE THE LARRY RUMOR, BECAUSE THE LARRY RUMOR DON'T STOP. For those not ~in the know~, Larry Stylinson is the pairing of Harry Styles and Louis Tomlinson, a ship some One Direction fans (a group known collectively as "Larries") believe to be true. So true, in fact, that there are literally countless YouTube videos, Tumblr accounts, Twitter handles, fan fics and more dedicated to the idea that the 1D bandmates are in a romantic relationship together and their management is trying to keep it under wraps. Though Styles has remained coy about his sexuality, Tomlinson has brought his trademark sass in regards to his sexual orientation, stating time and time again that he is straight and does not appreciate all of the Larry rumors. "This is a subject that was funny at first but now is actually hard to deal with, as I am in a relationship," he told Tumblr's Storyboard in 2012. "Me and Harry are best friends. People look into our every move — it is actually affecting the way me and Harry are in public." Of course, Larry fever has stood the test of time in One Direction fandom, once again making headlines in June 2015 after Harry Styles wrapped himself in a Swedish flag on stage — a flag that had an iconic Larry tweet printed on the other side. Even though Styles was clearly not aware of the Larry connotations at the time (he didn't even see the other side of the flag), the action undoubtedly sent Larry stans everywhere to their graves and then back to life in one fell swoop. RIP.